LSU students performed very well on the Virginia Tech Regional Math Contest. This annual competition consists of a challenging two and half hour written exam, and there were more than 700 participants from 95 colleges and universities. Out of a maximum possible score of 70 points, the national median was 1 point, and nearly half of all competitors scored zero. 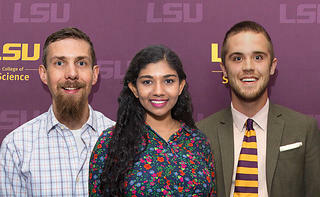 LSU had 7 students earn a positive score, led by Sonia Azad with 16 points and Derek Walker with 14 points; they both ranked in the top 20% of students nationally. The other LSU students to earn positive scores: Jonathan Cangelosi, Shelby Hust, Connor Sanford, Alyssa Smith, and Blake Tillman. The group is coached by Professor Karl Mahlburg. Photo (from left): Karl Mahlburg, Sonia Azad and Derek Walker.